A wide range of designs, printed on TAPESTRY CANVAS and TAPESTRY KITS for people new to needlepoint, experts and everyone in between! Download our PDF catalogues to find your favorite designs. Download our full catalogue with more than 600 designs of portraits, animals, landscapes, flowers and more. We enrich our collection with novelties every year. In 1958 a young and talented girl, LISA TSIRIKA, who became Mrs. Soulos 10years later, was starting her carrier as a designer in one of the biggest textile mills in Greece. By 1960, she had made up the decision to start her own business and involve in embroidery designing. So, she took the big step and that year she started her own business, designing original gobelin miniatures on silk. Very soon her unique and inspired work made her one of the leader in the market. In 1972, she and ANDREAS SOULOS, her husband who was already involved in screen printing, decided to establish a new company producing PRINTED CANVASSES FOR EMBROIDERY. They called their canvasses "GOBELIN L", where the "L" stands for Lisa. In 1999 "A. SOULOS & Co" (GOBELIN L) acquired the competing company "DIAMANT" and since then has been producing both collections. By the middle-end of ‘90s, their son Yiannis Soulos and their son in law Vasilis Barakos took over the responsibility of guiding the company to new challenges and new ideas. "I. 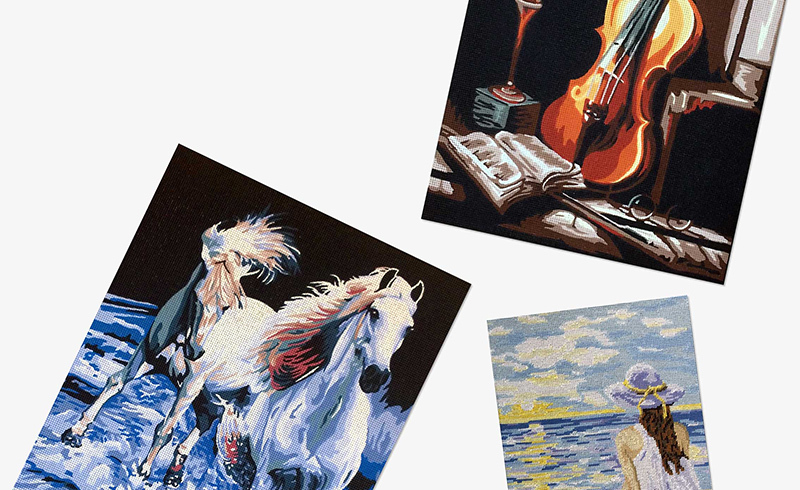 A. SOULOS & Co" specializes in printed canvasses, cushion kits and needlework kits. Company’s premises are located in a suburb close to Athens and the international airport. A newly built factory of 2,000 square meters with modern, high capacity equipment and machinery make it capable of preparing and delivering orders fast and reliably with no sacrifice of quality. 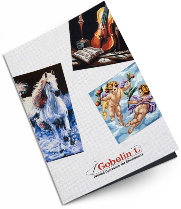 GOBELIN L is one of the main suppliers to the Greek market and exports to more than twenty five countries. Creativity, new ideas, high quality and customer service have always been the aspects that we invest in for the present and future of our business. Thank you for making us your choice. Complete embroidery kits for stitchers of all skill levels, also for STARTERS. 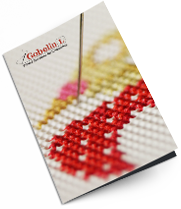 Download our PDF catalogues and visit the EMROIDERY KITS category. 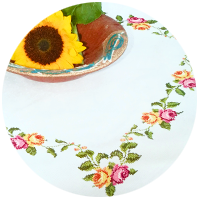 Embroidery kits for counted x-stitch, completed with high quality AIDA zone tablecloth, cotton 100%. 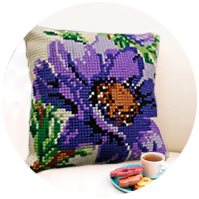 A wide range of unique designs for cushions, printed on tapestry canvas. The kits also contain acrylic yarn, needle and instructions. A large collection of printed designs for tapestry. A variety of portraits, animals, landscapes, flowers, religious and more. Popular article sizes and even bigger dimensions, such as 90*130cm, 60*125cm, 100*100cm are available. We use the finest raw materials and screen printing technique for superior quality. …is a printing technique whereby a mesh (screen) is used to transfer ink to an object (tapestry canvas in our case). 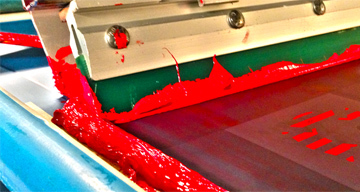 One color is printed at a time, so several screens can be used to produce a multicolored image or design. 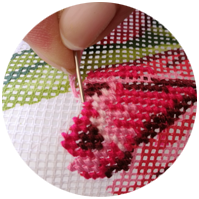 Screen printing technique provides ink stability and bright-clear colors on the tapestry canvas for a unique and quality result. 49 Kastorias & Fthiotidos str.